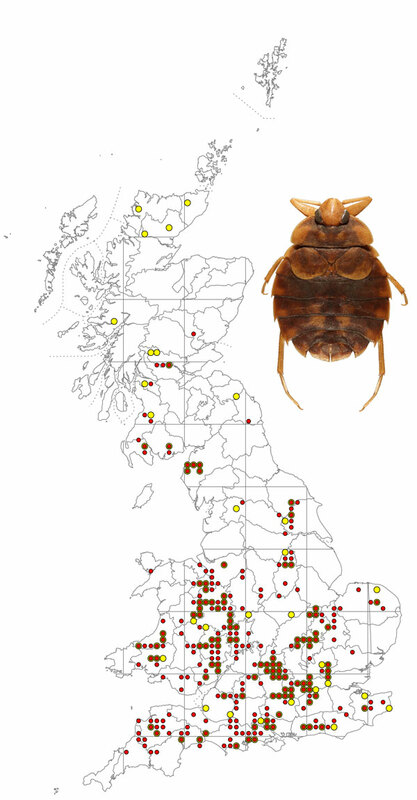 This bug is confined to ancient river systems in England, Wales and the southern half of Scotland (although there are older records for the far north). It is widespread but local and occurs among stones or gravel, with some silt and sparse vegetation, in streams and rivers where the water is fairly fast flowing. A. aestivalis is wingless (micropterous) and never leaves the water. It is able to swim rapidly, or walk slowly over the substrate, and feeds on a variety of small invetebrates, especially fly and mayfly larvae. It can inflict a painful bite if handled carelessly. The bug is densely covered by microscopic hairs which are un-wettable and trap a film of air over body which connects with the spiracles. This forms a permanent physical gill allowing the exchange of respiratory gases while the bug remains permanently under water. Adults overwinter and mating occurs in spring and summer, eggs being laid on stones and occasionally old mollusc shells. Larvae are abundant in August and new adults appear in September. A. aestivalis is sensitive to pollution and once eliminated from a site can only return when conditions improve if a population has survived elsewhere in an unpolluted part of the river system, or if accidentally or intentionally transferred from another unconnected site. The map is based on records from NBN Gateway, with yellow dots showing pre 1990 records, reds dots 1990 – 2015 records and red on yellow dots overlapping records. The bug occurs throughout Ireland. Aphelocheirus aestivalis is quite unlike any other British water bug in both habitat and appearance, so easily identified. It is 8.0-10.0 mm in length.